Could VueMinder Be the Best Calendaring Program? In these days of cloud-based services like Google Calendar and Zoho, having a dedicated desktop calendar application almost seems like an anachronism (even Microsoft Outlook does email in addition to calendar duties). But VueMinder Pro ($50, 60-day free trial) is anything but anachronistic. 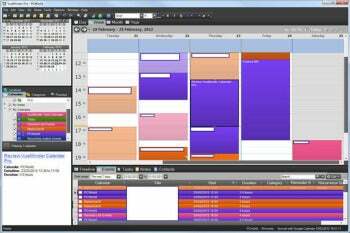 This thoroughly modern calendar application synchronizes with online calendars and offers a richer interface than its Web-based competitors. VueMinder Calendar Pro supports multiple calendars and features a very customizable interface. In addition to the main application, VueMinder Pro also has a desktop calendar that overlays your desktop wallpaper, and is fully functional: You can use it to schedule new events, edit existing ones, or just get an overview of your schedule at a glance. You can also move and resize the calendar, control its opacity to let your wallpaper show through, and remove its window borders so it really blends into the desktop. VueMinder's tooltips are some of the most useful I've ever seen. Most applications use tooltips to explain the interface; VueMinder uses them as part of the application, offering a condensed view of your schedule. Want to see what today holds? Hover over VueMinder's system tray icon (conveniently showing today's date), and the tooltip shows a brief view of your agenda. The same goes when you reschedule an event: Open the date dropdown box, and hover over the date to which you want to move the event. VueMinder will pop up a tooltip showing what's already been scheduled for that day, so you can instantly tell if that's a good time for that event. Unlike Google Calendar, VueMinder Pro does not automatically dim past and repetitive events. It does something better: It dims only events you mark as done. This subtle difference smoothly blends calendar with to-do list, and is pretty addictive once you get used to it. If you're looking for more powerful to-do functionality, VueMinder features a built-in Task List with multiple task statuses, hierarchical tasks, and Google Tasks synchronization. VueMinder Pro offers four traditional calendar views (Day, Week, Month, Year), but you can also view your events as a list, much like the Agenda view on Google Calendar. Here, again, VueMinder Pro offers more than Google Calendar: You can select what columns to display, define a date range for the list, and more. The agenda view is docked under the traditional calendar, so you can see both views at once. Unfortunately, clicking an event on the agenda view doesn't always activate it in the calendar view. You can work with multiple calendars, and even divide your calendars into groups so you can instantly filter the display to show only events from a particular calendar or group of related calendars. You can also add Google calendars, but I had a some trouble trying to synchronize my five overloaded Google calendars with VueMinder Pro. Most events would synchronize, but sometimes I would delete an event on VueMinder Pro and it would still appear on Google Calendar, even after synchronization. Developer VueSoft LLC said the problem was due to recent changes in Google's API and released a version that resolved most of the problems, but not all of them. As of this writing, VueMinder Pro still has some trouble with synchronizing repetitive Google Calendar events and with reassigning events to different calendars, but VueSoft is working to resolve this. These Google Calendar issues are the only thing keeping me from using VueMinder as my desktop calendar of choice, after previously being sold on using Google Calendar exclusively. VueMinder Pro is an excellent calendar application, even for demanding users.